Strengthening the Economy through tax relief for the middle and promoting an equitable taxation system based on ability to pay. She will support small businesses and labor unions, help create “green” jobs, and advocate for raising the minimum wage to a livable wage. Women’s Issues, such as protecting a woman’s right to choose, equal pay for equal work, gun violence prevention, and paid family medical leave for all working Vermont families. Universal Healthcare promoting a single payer system which can lower health care premiums and prescription medication costs as well as guarantee healthcare for all Vermonters. Environmental Justice by protecting our water supply and advocating for clean energy, listening to the voices of the community she represents. Dottye will support community needs and concerns especially in placement of industrial plants with possible harmful effects such as an asphalt plant. Social Justice by advocating for voter’s rights, racial justice, prison reform and worker’s rights. 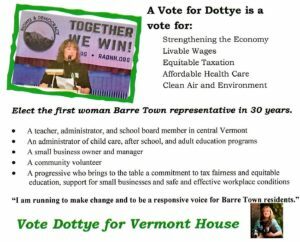 I am running for office to offer Barre residents a different choice. For years, Barre Town representatives have been elected from a select group of town members. 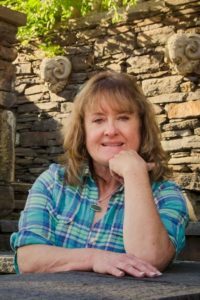 Although I am from a more working class section of Barre Town, I understand the issues that affect Barre Town residents in general. I am an inclusive leader willing to give voice to and serve, not just the few, but the entire population of Barre Town in all of its diversity. I offer support to issues of importance – economic sustainability, affordable health care, local control of schools, small business support, livable wages, equitable taxation, and clean air and environment. The crux of this election is about who will make life more livable for those of us who struggle to survive. Regardless of group or affiliation, we all have concerns about economic stability which are impacted by other issues such as health care, taxes, and employment. I want to bring a new perspective to those issues and new energy in tackling them. I will win this vote to help make government in Vermont more workable for the average Vermonter. 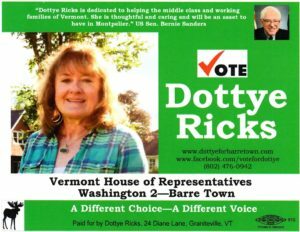 I intend to give voice to the many Barre Town residents whose issues are not being heard nor supported and whose demographics have not been represented in the House in many years. I will seek solutions for our economy whose backbone is our small businesses. I am not running for an “office” nor to achieve the status of an office – I am running to make change.